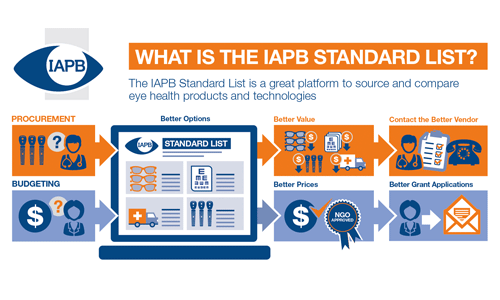 The IAPB Standard List is the world’s leading online procurement platform specifically developed for eye care service providers in developing countries. The list is a procurement and budgeting platform for eye health services in developing countries. It provides a carefully evaluated range of technologies from trusted suppliers, enabling IAPB members and their partners to access them at specially negotiated prices. The Standard List is currently an information service only, offering discounted prices to eligible eye health providers. It is not an automated procurement process. Shopping lists can be downloaded and printed to enable users to order direct from listed suppliers.